Welcome to Grapevine Physical Therapy & Sports Medicine's patient resource about Posterior Cervical Fusion. Posterior cervical fusion is done through the back (posterior) of the neck. The surgery joins two or more neck vertebrae into one solid section of bone. The medical term for fusion is arthrodesis. Posterior cervical fusion is most commonly used to treat neck fractures and dislocations and to fix deformities in the curve of the neck. Surgeons sometimes attach metal hardware to the neck bones during posterior fusion surgery. This hardware is called instrumentation. What parts of the neck are involved? Surgeons do this surgery through the back part of the neck. The muscles on the back of the neck cover the bony ring around the spinal cord. The bony ring, formed by the pedicle and lamina bones, is called the spinal canal. The spinal canal is a hollow tube that surrounds the spinal cord as it passes through the spine. The lamina acts like a protective roof over the back of the spinal cord. Facet joints line up on both sides along the back of the spinal column. What do surgeons hope to achieve? 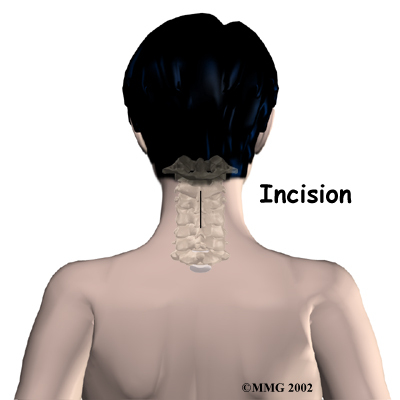 Posterior cervical fusion is used to stop movement between the bones of the neck. A serious fracture or dislocation of the neck vertebrae poses a risk to the spinal cord. The spinal cord is sometimes damaged by the fractured or dislocated bones. Surgeons hope to protect the spinal cord from additional injury by fusing these bones together. Surgeons also use posterior cervical fusion to help patients who have mechanical neck pain. 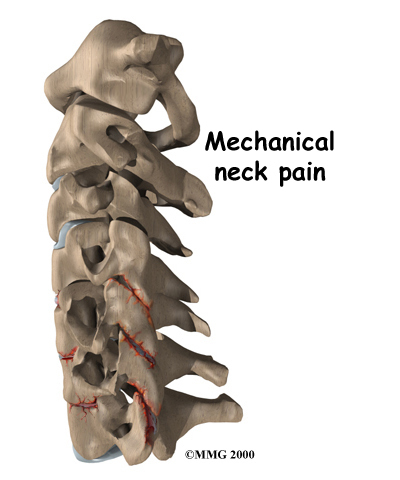 Extra movement within the parts of the cervical spine can be a source of this type of neck pain. Fusing these bones together prevents the extra movement, easing pain. Posterior fusion is also used to line up and hold the neck bones when there's a deformity in the curve of the neck. Normally, the neck lines up with a slight inward curve from the base of the skull to the top of the thorax (the chest area). One type of deformity that changes the curve of the neck is called kyphosis. This happens when the inward curve starts to bow outward. Some people are born with an outward bow in their neck. 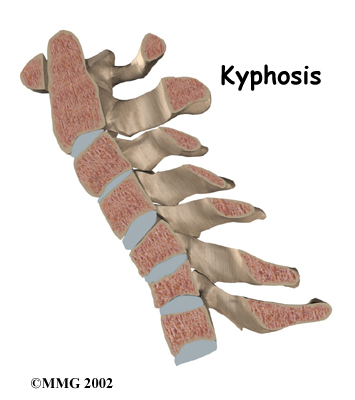 Kyphosis can also occur when a severe injury compresses the vertebral body into the shape of a wedge. Neck surgeries that weaken the bony ring around the spinal canal can also lead to kyphosis. When kyphosis is a problem, a posterior fusion procedure may be used to correct the curve and to fuse the bones together once they're in the right position. How will I prepare for surgery? The decision to proceed with surgery must be made jointly by you and your surgeon. You should understand as much about the procedure as possible. If you have concerns or questions, you should talk to your surgeon. Once you decide on surgery, your surgeon may suggest a complete physical examination by your regular doctor. This exam helps ensure that you are in the best possible condition to undergo the operation. Patients are given a general anesthesia to put them to sleep during most spine surgeries. As you sleep, your breathing may be assisted with a ventilator. A ventilator is a device that controls and monitors the flow of air to the lungs. This surgery is usually done with the patient lying face down on the operating table. The surgeon makes an incision down the middle of the back of the neck. Retractors are used to gently separate and hold the neck muscles and soft tissues apart so the surgeon can work on the back of the spine. A layer of bone is shaved off the surface of the outer ring (the lamina) of each vertebra to be fused. This causes the surface to bleed and to stimulate the bone to heal. (This is similar to the way the two sides of a fractured bone begin to heal.) Small strips of bone are grafted from the top part of the pelvis and laid over the back of the spinal column. This bone graft also helps stimulate the bones to heal together, or fuse. The muscles and soft tissues are put back in place, and the skin is stitched together. Most patients are placed in a rigid neck collar to lock the bones firmly in place. This is not intended to be a complete list of the possible complications, but these are the most common. Problems can arise when the anesthesia given during surgery causes a reaction with other drugs the patient is taking. In rare cases, a patient may have problems with the anesthesia itself. In addition, anesthesia can affect lung function because the lungs don't expand as well while a person is under anesthesia. Be sure to discuss the risks and your concerns with your anesthesiologist. Infection following spine surgery is rare but can be a very serious complication. Some infections may show up early, even before you leave the hospital. Infections on the skin's surface usually go away with antibiotics. Deeper infections that spread into the bones and soft tissues of the spine are harder to treat and may require additional surgery to treat the infected portion of the spine. 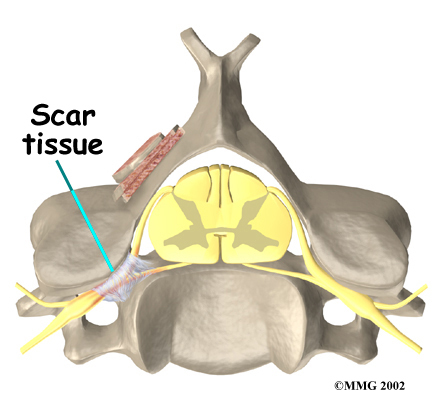 Any surgery that is done near the spinal canal can potentially cause injury to the spinal cord or spinal nerves. Injury can occur from bumping or cutting the nerve tissue with a surgical instrument, from swelling around the nerve, or from the formation of scar tissue. An injury to these structures can cause muscle weakness and a loss of sensation to the areas supplied by the nerve. Fusion surgery requires bone to be grafted into the spinal column. The graft is commonly taken from the top rim of the pelvis. There is a risk of having pain, infection, or weakness in the area where the graft is taken. After the graft is placed, the surgeon checks the position of the graft before completing the surgery. 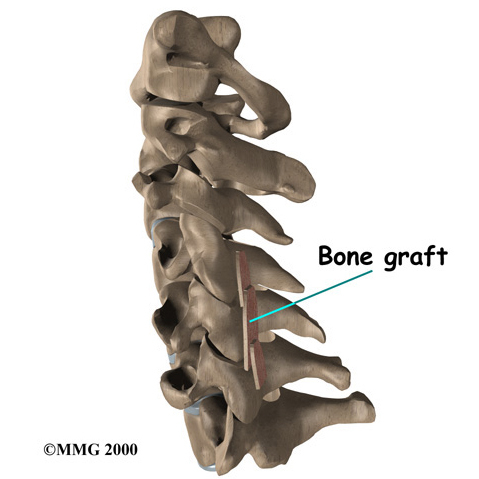 However, the graft may shift slightly soon after surgery to the point where it is no longer able to hold the spine stable. When the graft migrates out of position, it can cause injury to the nearby tissues. A second surgery may be needed to align the graft and to apply metal plates and screws to hold it firmly in place. Sometimes the bones do not fuse as planned. This is called a nonunion, or pseudarthrosis. 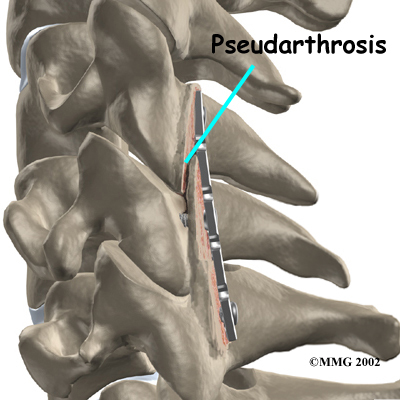 (The term pseudarthrosis means false joint.) If the joint motion from a nonunion continues to cause pain, you may need a second operation. In the second procedure, the surgeon usually adds more bone graft. Metal plates and screws may also need to be added to rigidly secure the bones so they will fuse together. 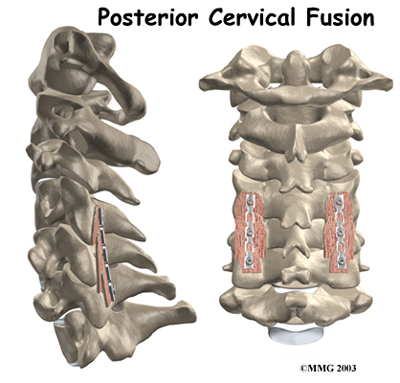 Posterior cervical fusion is an involved surgery. Not all patients get complete pain relief with this procedure. As with any surgery, you should expect some pain afterward. If the pain continues or becomes unbearable, talk to your surgeon about treatments that can help control your pain. Most patients are placed in a rigid neck brace after surgery for several months. These restrictive measures may not be needed if the surgeon attached metal hardware to the spine during the surgery. Patients usually stay in the hospital after surgery for up to one week. But they can start to get up as soon as they feel up to it. Patients are watched carefully when they begin eating. They usually drink liquids at first. If they are not having problems, they can go on to solid food. A Physical Therapist will schedule daily sessions to help patients learn safe ways to move, dress, and do activities without putting extra strain on the neck. Patients are able to return home when their medical condition is stable. However, they are usually required to keep their activities to a minimum in order to give the graft time to heal. Outpatient Physical Therapy is usually started four to six weeks after the date of surgery. What should I expect as I recover? Although the time required for recovery varies, rehabilitation after posterior cervical fusion can be a slow process. If the spinal cord was injured from a neck fracture or dislocation, patients may need intensive and ongoing rehabilitation for the neurological condition or paralysis. When the spinal cord has not been damaged, patients may need to attend Physical Therapy sessions for two to three months and should expect full recovery to take up to eight months. When you begin your Grapevine Physical Therapy & Sports Medicine rehabilitation program, our initial treatments are used to help control pain and inflammation. Our Physical Therapist may use ice, electrical stimulation, massage and other hands-on treatments to ease muscle spasm and pain. We will then slowly add active treatments. These include exercises for improving heart and lung function. Walking and stationary cycling are ideal cardiovascular exercises. Our therapists also teach specific exercises to help tone and control the muscles that stabilize your neck and upper back. We will then work with you on how to move and do activities. This form of treatment, called body mechanics, is used to help you develop new movement habits. This training helps you keep your neck in safe positions as you go about your work and daily activities. At first, this may be as simple as helping you learn how to move safely and easily in and out of bed, how to get dressed and undressed, and how to do some of your routine activities. Then we'll teach you how to keep your neck safe while you lift and carry items and as you begin to do other heavier activities. As your condition improves, our Physical Therapist will begin tailoring your program to help prepare you to go back to work. Some patients are not able to go back to a previous job that requires heavy and strenuous tasks. We often help as a resource to suggest changes in job tasks that may enable you to go back to your previous job or to do alternate forms of work. You'll learn new ways to do these tasks in ways that keep your neck safe and free of extra strain. Before your Physical Therapy sessions end, our Physical Therapist will teach you a number of ways to avoid future problems. Grapevine Physical Therapy & Sports Medicine provides services for Physical Therapy in Grapevine. 218 E. Dallas Rd. Ste. Copyright (2018) Grapevine Physical Therapy & Sports Medicine. All rights reserved.